Connector Protector Pull Sleeve 3/4"
Pull Cables & Bundles Faster, Safer & Easier! Today’s technology often requires installation of multiple wires, cables and structured cabling. Retrofit installation of such lines has always been difficult if not impossible to accomplish without damaging your cables or otherwise spending enormous time trying to prevent damage or loss of cable during the installation process. 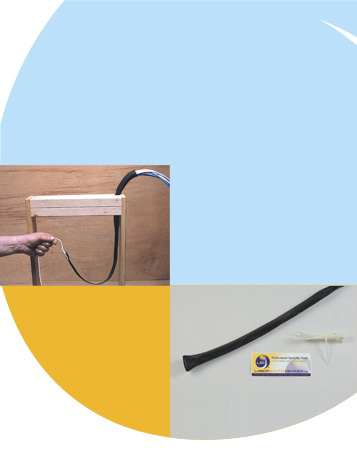 Elaborate wire preparation is usually required – stripping, staggering the ends of bundled cables, and using time consuming taping techniques needed to secure the bundle together and to attach it to a strong pull line. What if you could avoid all that time and hassle? You can – with our unique pull socks made of our proprietary DuraSoc™ material. Our patented pull sock wire pulling approach uses a unique pull sock material that is flexible, expandable and contractible. Similar to a “Chinese finger trap,” these socks can be easily slipped over cable bundles and pre-connectored cables yet provide a super strong grip on the cable under pulling tension.